Women tend to really appreciate a master bathroom with all the amenities. 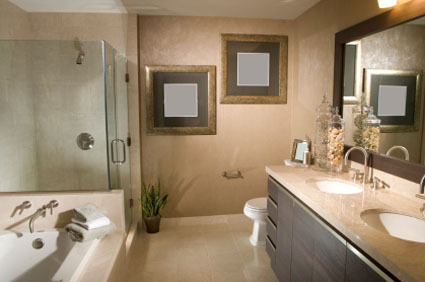 Added amenities are a major reason why upgrade your master bathroom is a popular home remodeling project. The goal for many with a master bathroom remodel is to have both a shower and a separate bathtub. Sometimes to have two vanities for him and her. To add more storage space, better lighting, and if space allows, a separate closed off room for the toilet. Upgrade your master bathroom may also involve new and updated finishes that are current. These finishes can also make a difference as to the look and feel of your home. Another project that sometimes gets included in a master bathroom remodel is a closet renovation. Depending on the space and layout of the master bedroom, people want to have their closets close to and integrated with the master bathroom. Completing changing wall locations and designing a new layout to fit everything is more expensive. But usually required if combining upgrade your master bathroom and upgrade your closet. By adding both these projects together, you have a desire for complete home remodel project. There are lots of brands and styles to choose from when selecting finishes for your master bathroom. It may help if you have an overall design theme and a color palette when shopping for these products. Understanding all the different products that you need will also help understand how to stay in budget. Here is a list to help you know what items you need to research. Sketching out the wall and room layout of your current bathroom, bedroom, and closets gives you a good overall picture. Then you could work with a designer or contractor to come up with different layouts for the various major elements. This will be important to see if and how everything you want will fit in your space. Beyond the layout, coming up with a style and color scheme is important. Do you want a modern, French, Italian, contemporary or traditional look and feel. Looking at pictures of other master bathrooms can help you decide on a style. Upgrade your master bathroom project involves a lot of different trade skills especially plumbing, electrical, heating and air conditioning, carpentry, and tile work. Most people hire a contractor to do the work, but you could also save some money if you have the skills and the time to do some of the work and talk with your contractor about this upfront. For more information on helping you manage this home improvement projects, visit us.